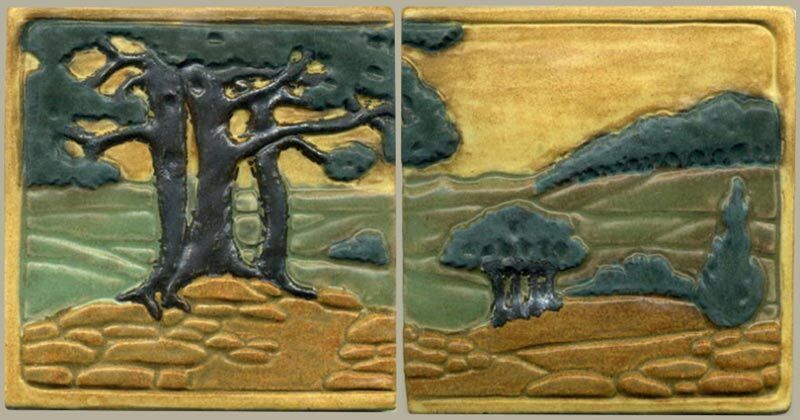 Our Oak Diptych is a two tile set measuring approximately 6" high by 12" wide. It features spreading oak trees against rolling hills. The surface is raised and textured and a raised border runs along the perimeter. Many color combinations are possible. If you want some combination of colors that you don't see, please call or email to discuss new possibilities. 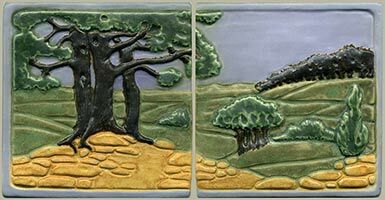 Colors shown: brown-black stain; pharsalia sky with butternut foreground and gray-green hills; blue-violet sky with gray-green hills and pharsalia foreground.